A sign says "Please close gate" and beneath that, "Farewell"
Continue reading "Walking In - 8/30/12"
That's what draws my attention...he's wearing underwear on his feet. So, I start shooting him from a safe distance with the long lens. The homeless routinely use these for lockers, trash cans, drop boxes, etc. But the underwear on his feet is a sign that cannot be missed. Continue reading " Walking In - 8/29/12"
Juniper, Date Palms, Ficus, and Hydrangeas. Agapanthus, lemon trees, and orange roses. Continue reading "Walking In - 8/22/12"
The only man I ever met that's "from Amsterdam"
We have the city to ourselves! Continue reading "Walking in - 8/21/12"
Continue reading "Walking In - 8/2/12"
Continue reading "Walking In - 8/1/12"
What madness this city conceals. Continue reading "Walking In - 07/31/12"
City workers huddle over subterranean water meters. "Did u find your keyboard?" he continues. "You had it when you left. You put it in your pants." "I know i know but i cannot find it now." Continue reading "Walking in - 7/26/12"
I begged off a couple of weeks from work and spent a week in MS and a week in CO just sort of hanging out. These are some shots from when I was in Monticello, MS the week of August 6th, 2012. The images were all captured on a Canon EOS 50D frame and a Canon EF 100-400mm f/4.5-5.6L IS USM image-stabilized, ultra-sonic telescopic zoom lens, or on a Canon EOS 50D frame with a Canon EF-S 17-85mm f/4.0-5.6 IS USM lens. Although I shot most of these images, Carrie shot a few good ones, including the cattle egret photos, and a very nice shot of Red Bluff. Basically, she ignored my advice and got a better photo than I did. It happens. Also, I think that Alyssa took the photos the two of us. This slideshow features a song by One Republic called Good Life. The images are compiled into an 8 Meg (4:00) Adobe Flash slideshow (1208MS.swf) that you should be able to open and view with any browser (Internet Explorer, Firefox, Safari, etc.). To view the slideshow, just click on the photo above. If you want to view the slideshow as a Windows executable, you can play this version (1208MS.exe), and it allows you to play, pause, skip forward, backwards, etc. 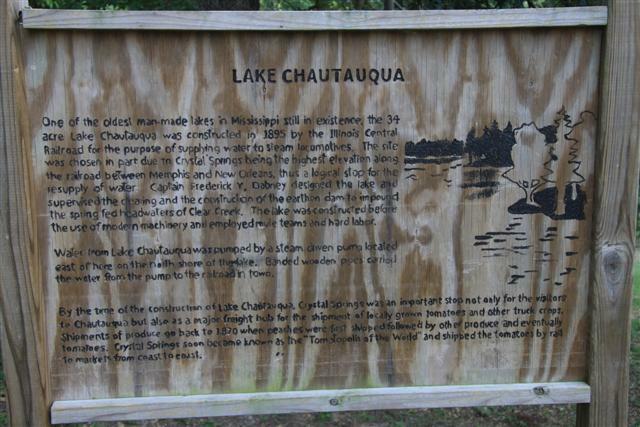 Continue reading "Postcards From Nowhere: Monticello"
One of the oldest man-made lakes in Mississippi still in existence, the 34 acre Lake Chautauqua was constructed in 1895 by the Illinois Central Railroad for the purpose of supplying water to steam locomotives. 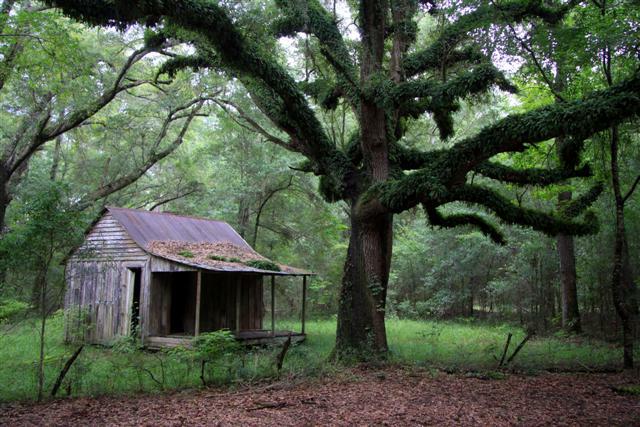 The site was chosen in part due to Crystal Springs being the highest elevation along the railroad between Memphis and New Orleans, thus a logical stop for the resupply of water. Captain Frederick Y. Dabney designed the lake and supervised the clearing and construction of the earthen dam to impound the spring fed headwaters of Clear Creek. The lake was constructed before the use of modern machinery and employed mule teams and hard labor. Water from Lake Chautauqua was pumped by a steam driver pump located east of here on the north shore of the lake. Banded wooden pipes carried the water from the pump to the railroad in town. By the time of the construction of Lake Chautauqua, Crystal Springs was an important stop not only for the visitors to Chautauqua but also as a major freight hub for the shipment of locally grown tomatoes and other truck crops. Shipments of produce go back to 1870 when when peaches were first shipped followed by other produce and eventually tomatoes. Crystal Springs soon became known as the "Tomatopolis of the World" and shipped the tomatoes by rail to markets from coast to coast. Continue reading "Chautauqua Park, Crystal Springs, MS"
As Rob Kiser wrote yesterday, his he has two Internet Service Providers (ISP); Wispertel/Skybeam and Century Link. This was done because of frequent outages, which cause this web-site to go off-line for days at a time. It's not so much that the network and/or power outages last for days, but nobody is around to reboot the I.S.P. modem and/or P.C. when Rob is traveling. I've often suggested that he plug everything into one of those outlet-timers, that will automatically cycle power to his equipment once-a-day at zero-dark-thirty. (2) connections from the internet to his web site, www.PeenieWallie.com (perhaps you've heard of it? ), work if one ISP fails. Continue reading "Rob's Home Network"
Wow. That wasn't easy. Today, I fixed three different internet service provider connections. Both of my connections to my two different ISP's weren't working when I woke up this morning. And neither was Michelle's. But I got all three of them working after struggling for some time. Wow. Big relief to have everything pretty much back to normal. Yikes. I wonder how other people do this? On my home network, I have 2 internet service providers, 3 wireless routers, 2 Network Addressable Storage units. 4 desktop PC's, 2 iPhones, 2 iPads, 3 notebook PC's, a printer, and a scanner. I honestly don't know how other people cope with this. Computers are pretty much all I've worked on in my life and they frustrate me so much I want to start Killing Strangers.